An artist impression of the tubular plasma structures. 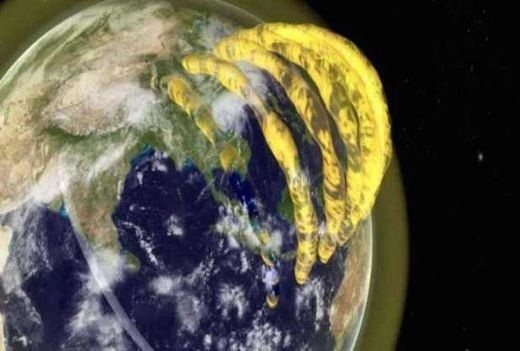 Astronomers in Australia have detected the existence of tubular plasma structures in the inner layers of the magnetosphere surrounding Earth - and made a 3D movie of them. 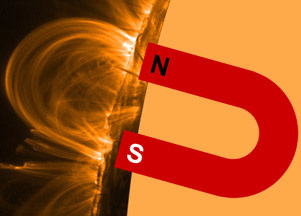 Earth's magnetic field is filled with plasma created by the atmosphere being ionized by sunlight. 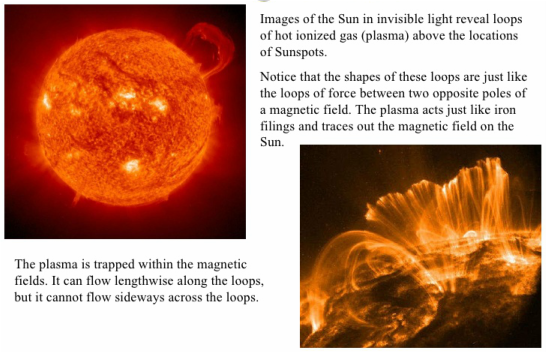 The innermost layer of the magnetosphere is the ionosphere, and above that is the plasmasphere. They are embedded with a variety of strangely shaped plasma structures including the tubes, as University of Sydney researchers and international colleagues have now proved. Leading the research was undergraduate student Cleo Loi. "For over 60 years, scientists believed these structures existed but by imaging them for the first time, we've provided visual evidence that they are really there," said Ms. Loi of the ARC Centre of Excellence for All-sky Astrophysics (CAASTRO) and School of Physics at the University of Sydney. "The discovery of the structures is important because they cause unwanted signal distortions that could, as one example, affect our civilian and military satellite-based navigation systems. So we need to understand them," Ms. Loi added. "We measured their position to be about 600 kilometers above the ground, in the upper ionosphere, and they appear to be continuing upwards into the plasmasphere. This is around where the neutral atmosphere ends, and we are transitioning to the plasma of outer space," she explained. The team used a radio telescope located in the desert of Western Australia - the Murchison Widefield Array (MWA) - to map large patches of the sky, and used the telescope's rapid snapshot capabilities to create a movie, effectively capturing the real-time motions of the plasma. The findings represent the first direct visual evidence for the existence of such structures. "We saw a striking pattern in the sky where stripes of high-density plasma neatly alternated with stripes of low-density plasma. This pattern drifted slowly and aligned beautifully with the Earth's magnetic field lines, like aurorae," Ms. Loi said. The telescope consists of 128 antenna 'tiles' spread over an area roughly three by three kilometers that work together as one instrument. By separating the signals from tiles in the east from the ones in the west, the astronomers gave the telescope the power to see in 3D. "This is like turning the telescope into a pair of eyes, and by that we were able to probe the 3D nature of these structures and watch them move around," said Ms. Loi. "We were able to measure the spacing between them, their height above the ground and their steep inclination. This has never been possible before and is a very exciting new technique." Ms Loi's supervisor, Dr. Tara Murphy, also of CAASTRO and School of Physics at the University of Sydney, praised the undergraduate's pioneering efforts. "When they first saw the data, many of her senior collaborators thought the results were literally 'too good to be true' and that the observation process had somehow corrupted the findings, but over the next few months, Cleo managed to convince them that they were both real and scientifically interesting," Dr. Murphy said. Ms. Loi has been awarded the 2015 Bok Prize of the Astronomical Society of Australia for her work. The research was undertaken as part of her award-winning undergraduate thesis and recently published in Geophysical Research Letters.